We’d love your help. Let us know what’s wrong with this preview of Eat Like a Gilmore by Kristi Carlson. To ask other readers questions about Eat Like a Gilmore, please sign up. Has anyone made Sookie's mac-and-cheese yet? Wondering how spicy it is. Rachel Yes! It had a smoky heat from the chipotle pepper, but it wasn't unbearable. Very enjoyable. I LOVE cooking and baking! I LOVE making recipes inspired by this show because why the heck not? What better is there than to mix two fantastic things and get something that tastes fantastic out of it? So of course i had to get my hands on this book! - excuse me i do not need a recipe book with 10+ pages full of COFFEE MAKING RECIPES! I get it. Its I LOVE gilmore girls! I get it. Its Gilmore Girls! You can't go make a Gilmore Girls inspired cookbook and NOT include a bit of coffee. But there is a bit and than there is stupidly amounts of it in a book that should be about FOOD and not drinks. - and while we are at it, lets talk about the drinks sections because why??? But there is a WHOLE lot of especially alcoholic drinks in this that made no sense to me at all. because why? I mean i get the coffee, but the amount of other kinds of drinks???? Okay i might be a bit based because i don't drink coffee OR any kind of drink of the kinds that were shown in this. so maybe i was just disappointed because basically half the book is stuff i would never EVER make because i am not interested in either coffee or alcohol. But to be fair i didn't expect a RECIPE book to have that amount of this type of "recipe" in it. - is there any kind of rhyme or reason to WHAT KIND of recipes where chosen? Because i did NOT SEE it! There were some recipes that made complete sense. Like the cheeseburger. Or the mock-turtle soup. Because yes, thanks thats a lot of typical Gilmore Girl right there that if you love the show you get those! Thats as iconic to the show as the coffee! But where are the chilly fries? The type of scrambled eggs Lorelai often orders? Where are the asian foods? Not only because of Mrs Kim, but how many episodes did we have where the girls in some configuration are eating Chinese, Indian or Al's Pancake worlds food?? The homemade Kimchi that Mrs. Kim makes for Lanes Wedding? Or her other ridiculous but fun recipes with lots of tofu or other soy products? Or at least the Egg Sandwich recipes that Mrs Kim makes for the Dance marathon episode? We get ONE measly recipes that is not even a recipes i can ever remember Mrs Kim making. Where are even half the things that Sookie mentions making? Also ONE Risotto recipe? There was an ENTIRE EPISODE where Sookie made basically all risotti recipes she could get her hands on and we get ONE recipe?? Can i also just mention i am missing Jackson's fantastic Jam? But we get Mushroom soup! WHERE ARE THE POP TARTS? Can i also just mentioned that i am hugely disappointed that i can find the GIF's for what i am mentioned without problems but don't get the recipes in a cookbook that is supposed to be about food mentioned in the show the GIF's are from? That should show you the kind of cookbook this is!! - the order in this book. Or should i say is there are an actual order in this book? Oh i want to make a Luke's recipe: And you know get a seciontion of luke food. Or an Gilmore dinner food. Apparently that is to easy. Lets just mix it all up and order it after some strange food categories that make NO sense related to the actual topic that this cookbook is supposed to be about. Who cares about the Gilmore Girls show and an order of recipes that would make sense to/for that if you can order it traditionally cookbook style?? but lets just switch to something else. Lets talk about the good thing. The good thing in this book is that you can see the love the people that created this book had for the show. But this is not a Gilmore Girls recipe book. This is not a book that lets you eat like a Gilmore Girl. This is a book that has a nice start but overall it falls rather flat. I mean it could be because i just know the show too well. And i have been told i have a rather spooky memory when it comes to movies and tv shows that if there would be a job that requires someone to tell you if that ever exist somewhere before and where it was - that would be the perfect job for me! So maybe i am too picky, too specific, too... knowledgable (is there such a think?) about this show. And might have spend why to long thinking about creating a blog that features Gilmore Girls related recipes. But this is not a Gilmore Girls book that is actually what i want from a gilmore girl eats recipe book! There are just way to few things that are actually really quintessentially gilmore girls. But this show just has so much food mentions, there is not even one episode that has not at least one meal in it. 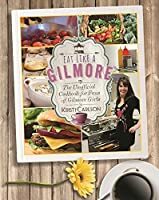 And while i never expected this book to have every single recipe ever mentioned -lets face it that would be a HUGE book!- i would have expected this book to pick more typical Gilmore Girls known and loved and talked about recipes that make more sense. I wanted this book to happen, really badly. I wanted to love it, i wanted to love it and come on here and RAVE about it. This cookbook is fabulous! They covered the most important recipes from the show. The recipes are varied in difficulty and style and look delicious. I can't wait to try them out! There are several souls and stews that look great for this winter. Plus, who doesn't want to try Patty's founders day punch?! So happy I bought this cookbook! A definite must for Gilmore Girl fans everywhere! This is actually pretty much a perfect first cookbook for my teenage son. Everything from french toast and spaghetti and meatballs and various pestos, through to more complicated/fancy dishes. And the Gilmore Girls link means that he's interested/motivated in the book and its recipes. Can't wait to try out some of these recipes. I may need to make a batch of muffins just so I have a reason to make the muffin bottom pudding pie. Also, the mac & cheese recipe sounds like heaven on a plate. I really want to buy this book. It has so many easy recipes (including drinks) that I will want to make again and again. I checked this out as a library book and to be honest, I really now want (or even need!) a copy of my own! This book has great recipes and even tells you what episode of Gilmore Girls it comes from. I love how this book also has pictures of the foods that accompany the recipes. I think any Gilmore Girls diehard fan needs this book. Seeing how Gilmore Girls always makes me hungry (Luke's fries and burgers especially does it for me), I can now eat like a Gilmore all thanks to this book. Will I ever make anything out of this? Unlikely. Particularly amusing/annoying - two different cookie recipes in which add-ins are to be pushed into the hot cookies as they come out of the oven (chocolate chips in one case, mini marshmallows in the other). Do I need to own two copies? No, but I gave one to my daughter for Christmas, and she gave one to me. This is a charming, relate-able, easy to read and entertaining cookbook. Pull this up to learn how to make fancy coffee drinks with ease, make a muffin-bottom pie, or just relax and pretend that you are in Stars Hollow. This was cute! If I was big into baking, I think I would've loved it. I did note a few of the recipes to try, but not enough to warrant owning this. Still worth a read for GG fans! Between Friday night dinners, Sookie's profession, and Luke's diner, the Gilmore Girls are almost constantly eating (or rather believed to be eating, because we never really see it. I recently read an essay collection about Lorelai and Rory's perceived consumptions and psychological analysis of their appetites that was fascinating...but I digress, like usual). This collection is cute and full of fairly easy recipes for foods that are mentioned throughout the series. 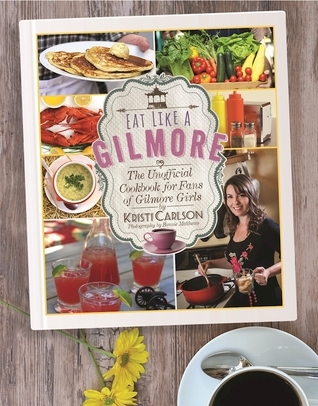 This is a fun collection that Gilmore Girls fans would enjoy and even cooks with the kitchen skills of Lorelai could probably follow each recipe's directions. -hot chocolate: this recipe made the second-best hot chocolate I've had (second only to the hot chocolate I had in Paris, and even then it's almost a tie). It's very creamy and rich. -orange-glazed muffins: these were good but nothing special. -Founder's Day punch: just okay. It wasn't as alcoholic as I expected. Can't wait to get my hands on it!!! To be fair, I haven't actually tried any of the recipes in here yet. :) I found this book thoroughly enjoyable just to look through. True Gilmore Girls fans will appreciate all the references put into the photographs in this book. For example, the gorilla mask and blind-fold in the background of one photograph, or the cotillion gloves and fan in the photo with the chai latte ('pretty sure that's not a cinnamon stick'). They even got the right tablecloth for recipes Luke cooks in his apartment (c To be fair, I haven't actually tried any of the recipes in here yet. :) I found this book thoroughly enjoyable just to look through. True Gilmore Girls fans will appreciate all the references put into the photographs in this book. For example, the gorilla mask and blind-fold in the background of one photograph, or the cotillion gloves and fan in the photo with the chai latte ('pretty sure that's not a cinnamon stick'). They even got the right tablecloth for recipes Luke cooks in his apartment (cerulean, not olive). If you are a fan of The Gilmore Girls, then you will love this cookbook. The recipes are fantastic and I love the commentary and the glimpses back to the show and the reasons for the inclusion of each recipe. Nothing seems too difficult although some are more basic than others. Can't wait to try more of them. Fun book for die hard Gilmore Girls fans! Each recipe references a scene or memory from the show in which the dish was mentioned; recipes come from chefs/bakers who collaborated on the book. Fun, lite reading, and a walk down Gilmore Girl memory lane. This cookbook is a great tribute to the show. I love the photos as well as the blurbs written about each recipe along with the show tie-in. There are so many recipes I will be trying from this book. I may also be watching the show while enjoying some of them! best fan cookbook ever! I'm going to make so many dishes from this one. To Read: Yes, if you are a Gilmore Girls fan. Each recipe description includes a reference to a story on the TV show. Even if you don’t cook, you will enjoy these descriptions. If you are not a Gilmore Girls fan, you can probably skip it. There is not a lot of additional food or cooking content in the book, except in the cake section where there are some decorating tips. To Look At: Sure. Each recipe has a photo, and they are well-done. But there is not a lot new here unless you want to see what To Read: Yes, if you are a Gilmore Girls fan. Each recipe description includes a reference to a story on the TV show. Even if you don’t cook, you will enjoy these descriptions. If you are not a Gilmore Girls fan, you can probably skip it. There is not a lot of additional food or cooking content in the book, except in the cake section where there are some decorating tips. To Look At: Sure. Each recipe has a photo, and they are well-done. But there is not a lot new here unless you want to see what your favorite food mentions on Gilmore Girls would look like up close, especially the beautiful cakes. I love the anecdotes and nods to the show, and I can’t think of a better way to make the characters come alive than to make their food, and I’m really excited to try some of the recipes, especially the peach sauce. Yum! I just was a bit let down by the book in general. One of my favorite things about a cookbook is the photography, and the photos in this book were no good, and the borders around the pictures were distracting and busy. As both a Gilmore Girl fan and a lover of cookbooks, I can say this is only average. In fact, I quit reading it for over a year before forcing myself to finish it. Nothing spectacular. Trivia for each recipe as well as a photo. Edited to reduce my rating because I was reminded from other reviews the horrible section of alcoholic drink recipes. Quite honestly, I felt kinda ripped off with the price of this book because it didn't deliver what it promised. This cookbook is lovely. Really brings the show back for me. Majority of the recipes aren't too difficult if your not much of a cook. There are pictures for every recipe so you know what they look like and things can be substituted for healthier options if that's your taste. So much detail and love was put into this cookbook and it shows. Can't wait to make so many things from here! My mom and I are huge Gilmore Girl fans. I've loved the show since middle school, and my mom got into it when it came on Netflix. I got her this cookbook for Mother's Day, and we both enjoyed reading it and recognizing food from the shows. Neither of us are huge cooks, but I plan on attempting a few of the recipes with friends while watching Gilmore Girls. This is the perfect gift for a Gilmore Girls fan! This cookbook is a lot of fun if you're a fan of the tv show (And I am!). The recipes are simple which can be a huge relief sometimes. The open-faced turkey sandwich is delicious. The bananas foster French toast is on my list to try. High novelty factor. Not really any recipes I want to make in it. This was a fun look back at the show and its crazy events. Very nicely put together and had some scrumptious recipes. Fun cookbook GG style. How likely to use the recipes? Ummm not very. They are fun to read though. Definitely are reminding me of the show.